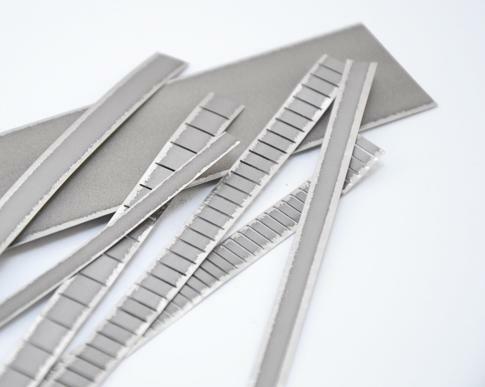 The Coated Strip uses SAES St707 or St101 powder laminated on both sides of a thin metallic strip, which can be either magnetic (Nickel) or a-magnetic (Constantan). The powder is firmly attached to the strip by cold compression bonding, without using any binder. The thickness of the getter layer is about 70 micrometers on each side of the strip. The laminated powder retains a relatively high degree of porosity (surface area of 1500 cm2/g) which ensures large gettering performance per unit area. The St707 Strip, which is manufactured as a continuous ribbon, can be cut to specific length to meet user's needs. The strip is flexible in nature and can be bended to a certain extent, making it easier its accommodation in the final device or vacuum chamber. Activation by passage of current through the strip is possible, as well as passive activation during a thermal process like a vacuum bake out. The available formats are reported in the brochure. The St101 Strip is manufactured as a continuous ribbon and can be cut to specific length to meet user's needs. A Strip cut piece can be welded inside the Lamp bulb on the metal frame to a certain distance from the burner: the distance depends on the lamp type and the production process. The getter strip can be fully activated (Radio Frequency) or partially activated (exposure to the Lamp burner). Available formats in the brochure.